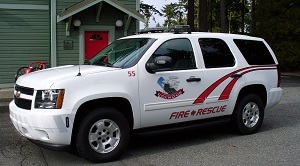 Rescue 56 was delivered in 2003 and is the "workhorse" of the Colwood Fire Department. 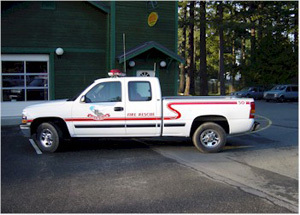 It is superior in design and performance, has many technological features that make it a valuable multi-purpose vehicle suiting a variety of rescue and fire suppression support needs. 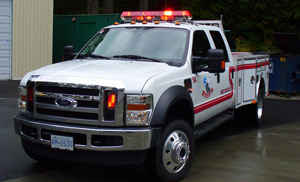 This apparatus is first to respond to all rescue, motor vehicle incidents and medical aid calls in the city. This vehicle is second due engine for the department. 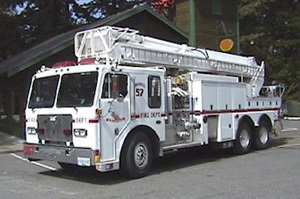 It is in excellent operating condition and meets current applicable standards for fire apparatus. It is maintained in superior fashion to ensure NFPA compliance. This vehicle has now completed 50% of it's service life expectancy. 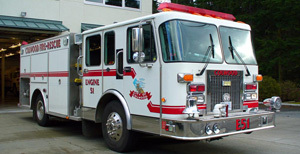 This engine is the newest to the fleet and is our front line engine. E52 currently sits as our first due engine for the department. 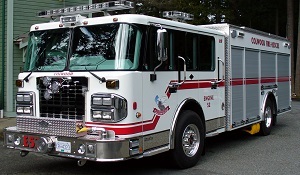 This vehicle has had a mid-life rebuild and is in good condition, meeting most of the current standards for fire apparatus. It has passed it's annual pump test. This vehicle is recommended for replacement in 2011. Total Length - 32' 2"
Special Features, include automatic turning and backup cameras, tire inflation monitoring system, complete driver and officer VMUX display control heads and 100% LED lighting package throughout. 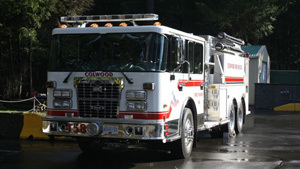 Truck Designed by Colwood Fire Rescue and proudly constructed by Hub Fire Engines of Abbotsford British Columbia, Canada.